Earn huge profits quickly with our best selling items. These chocolate covered treats are everyone's favorites and are so easy to sell at only $2.00 a pack. You pay only $1.00 a pack! Items come 20 packs to a box. 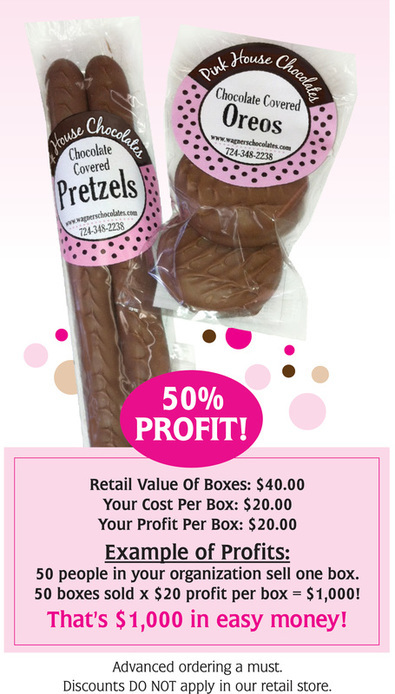 Have your fundraiser be a mixture of boxes of Oreos and pretzel rods, or just pick one of the products for the entire sale. Sell them at work, in school, to friends and family, or ask your local merchants to place a box in their stores! Pink House Chocolates has been a quality part of our community for 40 years. Our employees are people you know from the area. We consider it an honor to join in a fundraising effort with you. It is our contribution back to a community that supports us! We have a fundraising program for both Easter and Christmas.